A dialogue between two clarinets, between two different schools of interpretation, based on improvisation and some favorite musical themes. Manos Achalinotopoulos, is widely considered as one of the leading clarinet players in Greece and the wider region of the Balkans. He effortly handles many musical styles from various regions, and still preserves a unique personal style, incorporating in his playing elements from classical, jazz and world music. He is professor at the Music Department of Macedonia University / Thessaloniki. Romanian Alex Simu is the main subject teacher at the Codarts University for the Arts in Rotterdam within the jazz and world music departments. He is active in the field of organology and clarinet synthesis, and has innovated the tenor clarinet, as well as brought into contemporary use the alto clarinet, clarinet d’amour, and the bass clarinet d’amour. 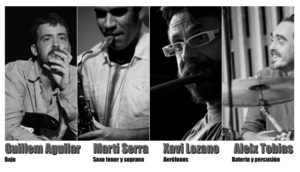 Their meeting is highly expected inside the festival Labyrinth Catalunya 2019, where they will investigate the sonority of the brass instruments family and present improvisations, compositions and folk tunes from their countries and beyond. Quartiana is a group creating new music, formed by Martí Serra (saxos), Xavi Lozano (aerophones), Guillem Aguilar (bass) and Aleix Tobias (drums and percussion). These four musical-brothers play together for the las twenty-five years, since their beginnings as students in Badalona (Barcelona). Although each one has followed his own artistic path, they have always shared projects (Toc Mut, Xampola, Eliseo Parra, Coetus …) and above all the passion for keep on learning. 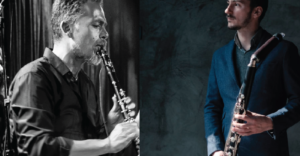 Serra is known in the world of jazz; Tobias and Aguilar are the rhythm base par excellence in the World Music in Catalunya, and Lozano is a virtuoso of any blow-able tube, whatever the material, the shape, or the number of holes. Their repertoire, formed by original compositions of the different members of the group and some versions, is an open window to sonorities that extend from jazz to traditional “roots” music of the Iberian Peninsula (with rhythms such as the jota or the sorteao that will suprise you), the Mediterranean or Brazil.